Apache(tm) FOP - a print formatter driven by XSL formatting objects (XSL-FO) and an output independent formatter. The Apache™ FOP project is part of the Apache™ Software Foundation, which is a wider community of users and developers of open source projects. The latest version of FOP is available at FOP 2.3. Support for each of the standard's objects and properties is detailed in FOP Compliance. Download options include a precompiled version, source code, and many example files to get you started. Resources include links to XSL-FO introductions and many other useful references. A checklist for Getting Help will guide you toward maximizing the usefulness of FOP. FOP is proud to be part of Apache's XML Graphics project. This image is a demonstration of a real two page document. The XML data on the left is formatted into the two pages on the right. 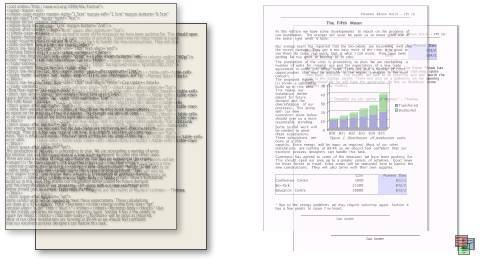 The document contains static areas that appear on every page, an external graphic, a footnote on the first page, and a table that goes across both pages. FOP uses the standard XSL-FO file format as input, lays the content out into pages, then renders it to the requested output. One great advantage of using XSL-FO as input is that XSL-FO is itself an XML file, which means that it can be conveniently created from a variety of sources. The most common method is to convert semantic XML to XSL-FO, using an XSLT transformation. 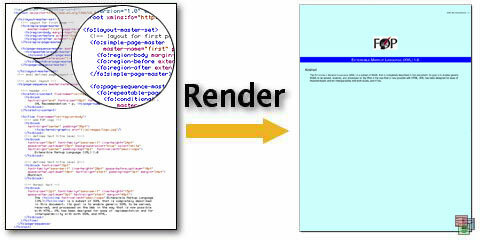 The goals of the Apache FOP project are to deliver an XSL-FO to PDF formatter that is compliant to at least the Basic conformance level described in the W3C Recommendation from 05 December 2006, and that complies with the November 2001 Portable Document Format Specification (Version 1.4) from Adobe Systems. Conformance to the XML 1.0 and 1.1 Recommendations, XSLT 1.0 and 2.0 Recommendations and the XML Namespaces Recommendation is understood. Other relevant documents, such as the XPath and XLink Working Drafts, are referenced as necessary. The FOP Project will attempt to use the latest version of evolving specifications.